There’s big updates and small updates since last month, so let’s go over the small news first. Firstly many thanks to Alex Esin who has been a huge help with logging bugs at the Github issue tracker. Simulation games are an incredibly complicated programming problem, and bugs/issues are inevitable once there’s a certain number of moving parts in the system (a number which was passed a long time ago!) so getting the community to highlight any issues they are finding is a huge help – particular when like this one they appear to be a combination of Intel no longer supporting older integrated graphics cards on Windows 10 with Java – something I would never have encountered on any of my development machines. If you’re finding any problems at all with the game, particularly any crashes to desktop, please sign up for a free Github account, get them logged on there (if someone hasn’t already raised it) and I’ll get back to you ASAP and make it a priority to fix. To this end, the game now logs out any information and error messages to a file named “log.txt” in the game’s main directory which will be a huge help with investigating any crashes – please include the contents of this immediately after a crash to desktop. Hello from the world of King under the Mountain! This past month involved a lot of tidying up and smoothing over of rough edges that have been hanging around since the Kickstarter pre-alpha demo. Along with a bunch of code improvements, this mainly comes in the form of being able to click on and interact with the game world a lot better! Whereas before you could only click on characters and items in the world and get a (rough) bit of info from the UI, now you should be able to click on everything you see in the game – walls and floors, rooms and stockpiles, things under construction, doors and the river! Even bigger news than this is that you can finally change your mind about where you’ve placed something as now you have the ability to cancel constructions in progress or remove rooms and furniture that you’ve built. I’ve also spent a bit of time supporting high (or low) resolutions (mostly thinking of 4k resolution monitors) so the UI scales up and down appropriately (no doubt this will be configurable in the future). Slowing down the bushes that currently grow quickly out of control, and doing something similar so trees can grow and spread across the map (slowly) – until now trees have been static since world generation except for changing leaf colour over the seasons. 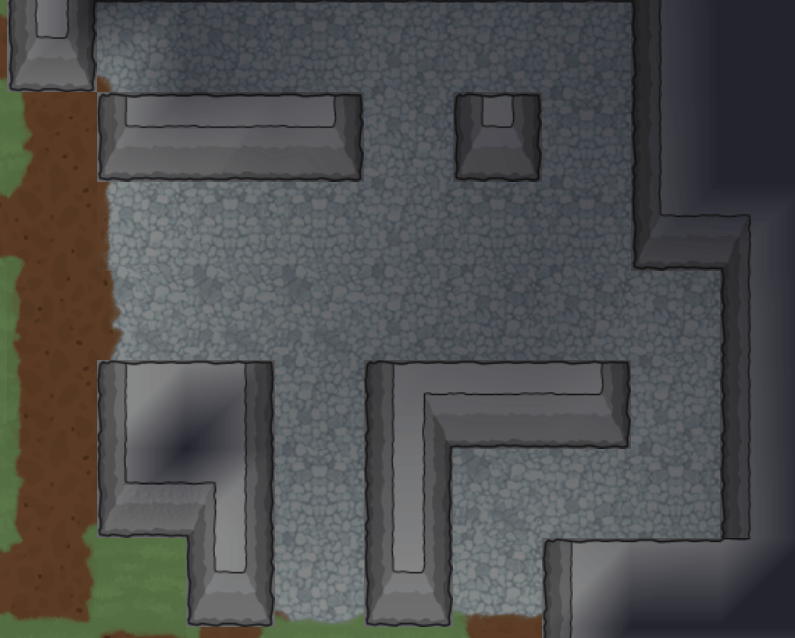 The ability to construct/replace floor tiles so your dwarves aren’t always living on grass or rock and they can get some nice smoothly-crafted flooring to stand on. More importantly, this extends to building bridges which is a necessity to cross the currently impassable river. This might be put off a little as I’m hoping to get some new art assets created to go along with this feature (more on this soon). Adjusting the length of a day and season to something reasonable with a rough UI to let the player know what the time and date is. While this isn’t that useful by itself, it’ll also bring in a place to put speed controls into the UI rather than having to rely on the 1, 2, 3, 4 number keys. Sorting out some art assets that haven’t been brought into the game properly – there’s a few different profession outfits which were missed out of being included in the current build, as well as some tiny improvements to how eyebrows look. The first of the basic needs of a character – sleep, which will introduce the concept of a working day to a dwarf, necessitate the construction of beds to avoid sleeping on an uncomfortable floor and become the first step to actual management of a settlement. Food, glorious food – For me this is the big one on the way to completing the alpha 1 checklist of the roadmap. Covering both foraging from bushes and planting crops for harvest, and also leading in to the other absolute basic necessity for the characters (needing to eat and drink as well as sleep). Thanks to art assets you might have spotted in an earlier dev blog, there’s nothing blocking development of growing crops although we could do with something to represent kitchens, breweries and how food is stored. Underground farming – While this could go into the epic mega-feature covering all kinds of food, there’s something very dwarven about growing mushrooms underground and this will also lead into the first steps of making the underground (cavern) areas a bit more interesting. Death – the other side of having basic necessities is the implications of not satisfying them, and in the case of food and drink that means hunger, starvation and eventually death! These are some quite chunky pieces of development work which I can see taking quite a while to complete, but its exciting to see the basics of the game emerging from what I still see as the tech demo of the pre-alpha build. Looking ahead to the rest of 2018, the rough goal is to have alpha 1 ready and released to the public by the end of the year. This is going to depend massively on what happens around the middle of the year though – the current plan is to launch a new crowdfunding campaign somewhere around July and/or join forces with an indie-friendly publisher to bring some investment to the project. With this in place I’m hoping to be able to dedicate at least a few months later in the year solely to development of King under the Mountain to get it to the publicly-available alpha 1 release. After the disappointment of cancelling the 2017 Kickstarter campaign and the slow build up back to development after the break for 6 months after that, I’m a lot more optimistic now of getting back to a decent delivery timeline for the game. I’m now in the process of getting more art assets commissioned which is entirely thanks to the many generous backers of the King under the Mountain Patreon page. While it’s a bit too soon to show what’s being worked on, I’m hoping to have a lot more on this next month. If you haven’t already, please consider backing the game’s patreon which has opened up a reasonable budget for new assets in the game at a time when I’m not able to finance these out of my own pocket. It really does help, and if you are one of those backers already, thank you so much! It is a huge motivation and sign of approval to see people willing to support the game financially. Backers at the $3 (and above) level now have access to the first new build since last year’s Kickstarter, downloadable from patreon.com/posts/king-under-pre-1-16584405 which lets you play around with constructing walls and seeing some of the other small improvements (such as assigned jobs blinking). Next month’s Patreon reward will be the new build of the game with the UI enhancements discussed above, and potentially some other items from the pre-alpha 2 checklist. Stay tuned! Hello undermountaineers! Does that work? Between family and/or Christmas it’s been a fairly slow and quiet month for King under the Mountain, so much so that I’m really intent on making more time available in the coming weeks. That said, there’s still been some development carried out over the last few weeks! The biggest feature is that it’s finally possible to build walls (out of wood or stone) rather than relying on mining to mark out areas for rooms and doors. As with most development at this point, this doesn’t quite have an effect on gameplay yet (other than giving another use for planks and stone blocks) but we’re still at the stage of laying out all the groundwork and base systems, before the interesting point at which they tie into and affect each other. Before long you’ll want to build walls and add a roof (where I’m not quite sure how that will be done yet – I don’t want to copy the way rooms/buildings are constructed in Prison Architect by requiring four walls and a door, but instead to leave it more freeform) to shelter your dwarves (or settlers of a different race) from the elements while they’re waiting for an underground home to be mined out (or perhaps you’re playing as humans who don’t like sleeping underground). This month was dedicated almost exclusively to research and development for getting flowing water, namely the river, into the game. In the end I’ve spent longer than I’d have liked on this feature, although having the river implemented unlocks the core game mechanics for the next section of development – farming crops leading into needing food and drink. The main reason for taking so long is that I spent a long time researching how flowing water could be represented in a top-down 2D game, which has not received much coverage that I could find. This seemed to be the route I wanted to follow, although this approach requires a flow map, and I felt a flow map generated or calculated for a map as big as those used in King under the Mountain would not be very feasible, or at least not fast enough for the game to run well on low-end hardware. Ideally I was after something tile-based, so it could be applied on a per-tile basis rather than needing something to be generated for the entire map. While I think I could have adapted the flow map texture to this problem, fortunately I stumbled across a much better water flow algorithm (for my purposes) devised by Frans van Hoesel of the University of Gronigen. We’re back! But where have we been? Well you may know that in March to April the Kickstarter campaign ran to a modest degree of success, but unfortunately tailed off into not meeting the desired goal. 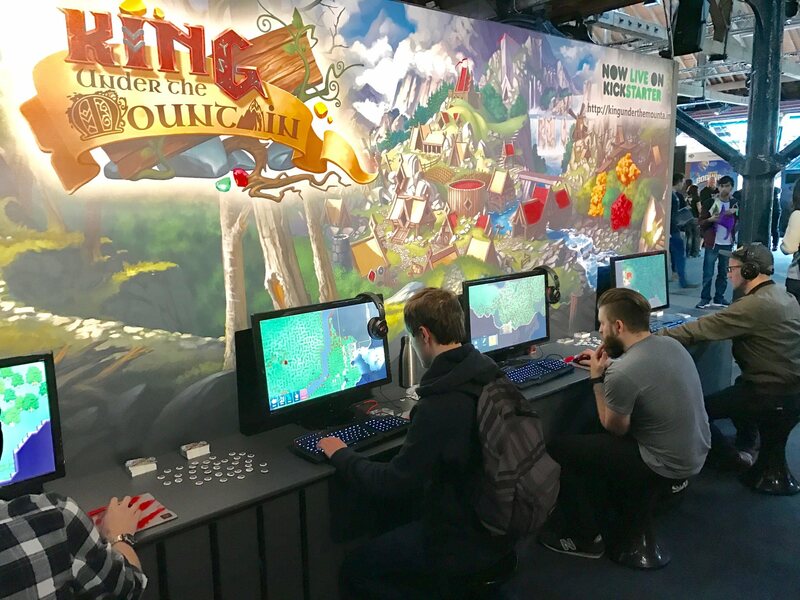 The main contributors to the success of the Kickstarter was a bunch of very positive coverage due to exhibiting at EGX Rezzed (if you dropped by, it was a pleasure to get to meet you!) as well as a feature on Rock Paper Shotgun which was a lifetime ambition achieved – as well as all the buzz generated by you guys! Thank you so much! Walls, how do they work? In this post I’m going to explain how walls work in King under the Mountain. Not in the gameplay sense of them blocking movement (and light sources!) but in the technical sense of how the art assets are put together and handled. First of all, no, this isn’t the monthly dev update to signify that development has kicked back into full swing *just* yet. Instead I’m trying to lay out some groundwork and guidelines to hopefully get some help with the project as well as a sort of technical primer for anyone interested. It’s no secret that King under the Mountain‘s visuals are heavily inspired by Ryan Sumo’s work on Prison Architect by Introversion. Much like the floor tiles, the walls need to seamlessly tessellate with each other and may end up forming many different shapes, such as differently aligned corners and T-sections of walls. When I cancelled the Kickstarter campaign, the plan was to re-launch it very soon with a much-reduced goal. This would help fund the freelance work being done on the game (mostly artwork, and some music) which is currently being paid out of my own savings. The original goal with the Kickstarter would allow me to focus 100% on the game, bringing it to release far quicker than development has been so far (as it is currently a “hobby project” in my spare time) as well as help fund this freelanced work. Having spent a lot of time thinking about it – if I was to follow the plan of re-launching the Kickstarter with a reduced goal, I’d be continuing development in my spare time (which is fine by me!). However, this comes with somewhat poor timing as I’m moving house next week (which if you’ve gone through a home sale and purchase yourself, you’ll know takes up a lot of free time to organise and move things in and out of storage) and my wife is expecting our first baby in August when we’ll just about have become set up in the new home. So after a great deal of thought, I’ve decided I wouldn’t be comfortable taking people’s money via Kickstarter now when I couldn’t commit to having enough time to devote to development or give a realistic estimate of an initial release window. The £45,000 goal with the original Kickstarter would allow me to switch my day job over to developing the game, with evenings and weekends free to sort out the move and family life. As I’ll now have to keep the day job (probably a wiser move in the gamedev world!) unfortunately it’s game development which is going to have to be put on hold for a while as I prepare for and then get settled in a new home with a new baby. This does not mean King under the Mountain has been canned or cancelled though! Instead plans have just had to be set back with a delay of a few months before I can get back into the swing of development towards the end of the year. My apologies for not putting out this update sooner – it was a tough decision and I’ve also been hoping to hear from some indie-friendly publishers as a Plan B to bring in development funding rather than the Kickstarter campaign but it’s not looking likely right now. So as it is things may go quiet for the next few months but then I’ll be bouncing back and pressing on to releasing Alpha 1 as described in the Roadmap. I don’t know yet if the re-launched Kickstarter will happen (still the most likely option) or if instead I’ll just work towards a releasable Alpha 1 version and start a soft early-access style launch from there. Finally I just want to say thank you for the really surprising amount of extremely positive coverage King under the Mountain has received during and around the Kickstarter campaign and I’m sure it’ll kick off again in the future! It was a fantastic experience being able to exhibit the pre-alpha version at EGX Rezzed and The PC Gamer Weekender, showing lots of genuine enthusiasm for the game which was awesome to see and a real motivator to keep pushing forward with it. Thank you for all your support so far and I plan to make this game into what people are hoping for from it! Hello world! We’re officially in the build up to Kickstarter and all the events that go with it – including two gaming expos! But first, here’s a brief look at the state of the game. This month has seen a lot of behind the scenes improvements and incremental updates as everything is prepared for kicking off work on the game’s first trailer, which will be produced by the talented M Joshua. You may notice in this video that there’s a lot more variety in the different outfits worn by the dwarves. These have been produced by Derek Restivo based on Anthony Avon’s character concepts and we’re excited to be able to present the final (first) set of them soon. There’s also now a full set of tools for the dwarves to use (and produce themselves) as the basics of the crafting system are put into place. We’re hoping to be able to show you some workshops and actual crafting in the very near future!